Info "I hate it when rocks block my temple..."
Temple Trap is a downloadable microgame in WarioWare: D.I.Y. and WarioWare: D.I.Y. Showcase. It was released on June 24, 2009 in Japan, May 24, 2010 in North America, and June 25, 2010 in Europe. 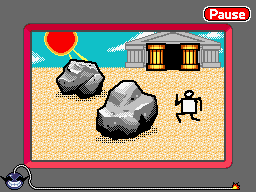 The game starts with two rocks and a temple moving from side to side on a sandy plain, each moving at different speeds and in different places. The player must stop all three of them so that neither of the rocks are blocking the temple entrance. After all the objects are stopped, a man comes on the screen and the words "GET INSIDE!" and starts moving from side to side. When tapped, he will walk forward. The player must tap him when he is in front of the temple entrance. If this does not happen, the game will be lost. This page was last edited on October 8, 2018, at 23:59.